The Mansoura and Al-Azhar Universities decided to expel two students, one for two years and the second indefinitely, in January 2019 because of a posted video, in which the student hugged his female colleague. Sanctions were later commuted after intervention by Sheikh Al-Azhar and Minister of Higher Education. This incident and similar earlier incidents point to the arbitrariness of student disciplinary measures and the encroachment of repression by university administrations over the space of personal freedoms after years of preventing students from political activity. AFTE issues this commentary on the incident of a hug of two students at Mansoura University, which ignited official reactions and resulted in disciplinary sanctions against both. 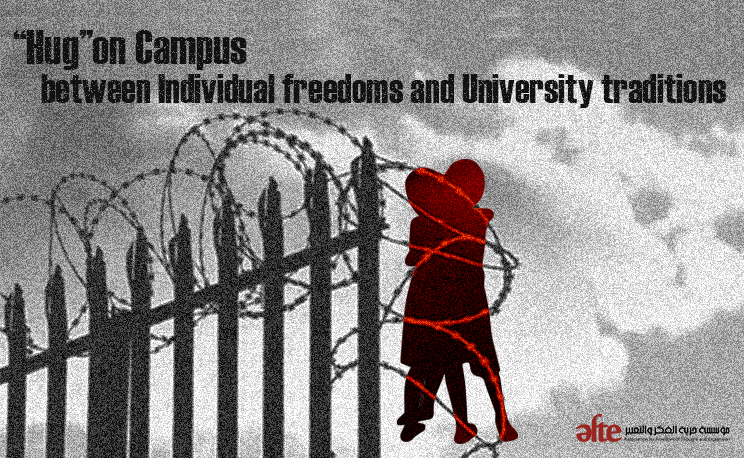 In the framework of AFTE’s efforts to support student rights and freedoms for years, we consider that those actions against the students is not separate from other oppressive practices faced by students over the years. University administrations have succeeded in banning political activity in universities and depriving students of competitive student elections, allowing them to transfer their repressive measures and practices to students’ personal freedoms. This seems to be an attempt to oblige students to abide to a “moral code” harmonious to the administrations’ views of the “traditions and customs of the university “. A video has been posted on social media since January 2, 2019, showing a student hugging his colleague at Mansoura University. After that, Mansoura University President Ashraf Abdel Basset directed the administrative security to speed the identification of the students. In a statement, the university administration confirmed that the university security department has identified the students has confronted them with the details of the incident. It was found that the male student was from the first year at the Faculty of Law, Mansoura University, while his colleague was not registered at Mansoura University, but was studying at the Faculty of Islamic and Arabic Studies at Al-Azhar University. The Mansoura student was referred to the Disciplinary Board of the Faculty of Law for breaching university values. The President of Mansoura University also sent a memorandum to Sheikh of Al-Azhar Ahmed Al-Tayeb because the student is studying at Al-Azhar University. Based on this memorandum, the President of Al-Azhar University, Muhammad Al-Maharsawi, issued a decision on January 12, 2019 to permanently expel her from the university. On January 14, 2019, the student from Mansoura University Law School was dismissed for two years for violating the values ​​and traditions of the university and violating the public morals on campus, despite the student’s apology, said Sharif Khater, Dean of Mansoura University Faculty of Law and chair of the disciplinary board. On January 14, 2019, Sheikh Al-Azhar Sheikh Ahmed Al-Tayeb demanded that the Supreme Disciplinary Council of Students at Al-Azhar University reconsider the punishment that was signed by the Student Disciplinary Board at the university against the student of the Faculty of Islamic Studies and Arabic Language as penalty for an unacceptable conduct during her presence outside the university campus, which constitutes an insult to our “religious and Eastern traditions”, in the words of Tayeb. He urged the Disciplinary Board to take into consideration the young age of the student and her educational future and to undertake the duty of advice and guidance before resorting to imposing sanctions. The Supreme Disciplinary Council responded to the request of the Grand Sheikh of Al-Azhar. It held an emergency session to discuss a review of the penalty of final dismissal of the student. The Council decided to cancel the decision of the Disciplinary Board issued in the final term, and only to deprive the student from entering the exams for the first semester of the current academic year. In the same vein, the Minister of Higher Education called upon the Higher Disciplinary Council at Mansoura University to reduce the punishment of dismissal for two years, which was approved by the Disciplinary Board of the Faculty of Law, in the interest of the future of the student. Subsequently, the Higher Disciplinary Board of the University responded to the invitation of the Minister and reduced the student’s penalty to deprive him of the exam for the first semester of the current academic year. The reduction of the penalties imposed on the two students seems to have ended the controversy about the abuse practiced by university administrations towards them. Here, the commentary addresses the abuse that the students faced, even with the easing of disciplinary sanctions. The Executive Regulations of the Law on the Organization of Universities regulate the rights enjoyed by students within universities, including the right to a fair and equitable disciplinary system, which also applies to the executive regulations of the Azhar organizing law. A number of measures should be followed to guarantee the right of university students to a fair and equitable discipline. Students referred to an investigation must be officially informed through a registered letter of access. Enabling students to defend themselves through the presence of their lawyers during interrogation, face prosecution evidence, and enabling them to make requests (such as unloading the content of the photograph in the incident covered by the investigation) , or request witnesses or otherwise. Investigation of a breach must accurately define the breach. The power to impose a penalty should not be excessively or arbitrarily used and the penalty must be proportionate to the act being punished. These measures are necessary to ensure fairness of the investigation of students. In comparison, none of these were fulfilled in the case of the two students, and penalties were announced in haste by other administrations. None of the university statements referred to any legal measures undertaken in informing the students or granting them the presence of a lawyer. The students of Al-Azhar University are subject to a disciplinary system stipulated in the Al-Azhar Organization Law. Article 246 of the Al-Azhar Organization Law specifies the offenses that require administrative punishment, including any act that violates honor and dignity or violates good conduct inside and outside the university, according to the fifth paragraph of the article. Article 248 of the Al-Azhar Organization Law specifies disciplinary penalties, for example, verbal or written warning, denial of attendance of one of the courses, dismissal from the College for a period not exceeding one month, dismissal from the College for a period not exceeding one semester up to final expulsion. The Disciplinary Board shall have the right to sign any of these penalties after investigation with the student. Article 124 of the Executive Regulations of the Law of the Organization of Universities No. 49 of 1972 provides for penalties that require the referral of students to an investigation or to a Disciplinary Board, which is similar to that of Al-Azhar Organization Law and its offenses (any act that violates honor and dignity or violates good conduct inside or outside the University). According to the statements of Dr. Ahmed Zare, spokesman of Al-Azhar University, the student in the hug incident was investigated and it was decided to expel her from the university for a flagrant act rejected by the university and traditions. It was the same reason mentioned by Khater, after the dismissal of the Mansoura student, where he said that the punishment is appropriate to the act committed by the student on campus for violating the values ​​and traditions of university, to which students must be committed within the university. Thus, the administrations of the two universities considered that the act committed by the students was a flagrant act contrary to the values ​​and traditions of the university, and accordingly the students were punished for committing an act of “insult to honor, dignity and good conduct whether inside or outside the university.” This led to the above mentioned penalties before the two universities reconsidered and reduced them. Although the reconsideration is welcomed, it still indicates the extent of arbitrariness of the imposition of sanctions from the beginning, as the departments of the universities of Mansoura and Al-Azhar initially sought to impose the maximum possible penalties for students in that incident, which is incompatible with the severity of the act, assuming the soundness of the universities’ interpretation of laws and discipline governing regulations. The “hug incident” at Mansoura University was not much different from the increased size of restrictions imposed on university students, who have seen administrative regulations and decisions as well as legislations imposed restricting their right to expression, organization and personal freedoms. Over the past four years, university administrations have begun to close the public space on campus, and eliminate political activity by banning student political movements, and impose disciplinary sanctions on hundreds of university students that amounted to complete expulsion for involvement in any political activity on campus. Universities have also been legally subject to the same rules as those set for the protection of military facilities, allowing students to be referred to military trials. The elected student unions were severely restricted in their activities and the student regulations governing their work were amended to weaken their role as student representatives. Thus, after restrictions imposed on public and political space in general, university administrations tended to impose more restrictions on personal freedoms and freedom of clothing, resulting in decisions of expulsion of some students, in violation of the principles of the Constitution and relevant international covenants. In a similar incident in 2017, the Disciplinary Board at Suez Canal University issued a decision to expel four students from the university, three females and a male student, after they hung a banner containing an apology from a student to her boyfriend. The President of Suez Canal University stated at the time that the Disciplinary Board had decided to expel the students, because of their behavior which is inappropriate to the ethics and traditions of the campus. There is a general tendency among university administrations to create an ethical code that determines the personal behavior and appearance of students inside and outside universities, a matter which goes beyond their mandate in the management and organization of the process of education and research. It can be said that the attack by university administrations on the personal freedoms of students is contrary to the provisions of the Egyptian Constitution. The Egyptian constitution guaranteed the personal freedom of all citizens and placed strict restrictions on non-infringement. Article 54 of the Constitution states: “Personal liberty is a natural right, not to be encroached upon … “. Article 99 of the Constitution stipulates that “Any attack on personal liberty or inviolability of private life of citizens and other public rights and freedoms guaranteed by the Constitution is a crime with no statute of limitations. The afflicted person can directly file criminal charges and the state and National Council for Human Rights should inform the Public Prosecution of any violation of these rights and may intervene in the civil suit in support of the injured upon his request, all in the manner prescribed by law”. Therefore, the decision by the administrations of Al-Azhar and Al-Mansoura Universities that an embrace between students violates the values ​​and traditions of the university, is actually violating the rights guaranteed by the Egyptian constitution. These arbitrary measures violate the principles laid down by the Administrative court, since the administrative authority in any facility is restricted by several conditions, the most important of which is that it does not affect personal freedom guaranteed by the Constitution to the individual. In view of international standards related to academic freedom, the Declaration on Academic Freedom, issued by the First World Conference of University Presidents at Columbia University 2005, emphasized the principles of universities, including “Commitment as a social institution through education and research by promoting the principles of freedom, justice, human dignity and human solidarity .. “. There is no doubt that Egyptian universities’ practices of violating personal freedoms violate these principles and violate the enjoyment of human dignity by students, as long as their personal conduct is subject to investigation and punishment by universities. AFTE draws attention to the importance of solidarity with university students in light of the numerous patterns of violations against them. It urges members of the academic community, students and professors, as well as those concerned with higher education from various institutions and bodies, to condemn the practices of university administrations that restrict the rights and freedoms of students. The administrations of the Egyptian universities shall stop the referral of students to investigation or disciplinary boards, for reasons related to personal freedom, and should abide by the relevant provisions of the Egyptian Constitution. The administrations of Egyptian universities should abolish all administrative decisions restricting personal liberties, especially decisions to prevent students from entering universities on the grounds of wearing clothes prohibited by university administrations. The administrations of Egyptian universities must grant the right of students to freedom of expression within universities whether in writing, in print, in the form of art, or by any other means of their choice.